I’m happy to welcome author Ravinder Randhawa onto the blog today with a guest post as part of the A Wicked Old Woman blog tour. A Wicked Old Woman is an adult contemporary novel full of drama, masquerade and mischief. In a bustling British city, Kulwant mischievously masquerades as a much older woman, using her walking stick like a Greek chorus, ‘…stick-leg-shuffle-leg-shuffle…’ encountering new adventures and getting bruised by the jagged edges of her life. This is an impossible and cruel question. I’ll pick from the many books that sit on my shelves, which stand out at the moment. His Dark Materials trilogy by Philip Pullman: This may be a bit of a cheat as there are three books here, but since they all follow on, the story counts as one. Needless to say the writing is brilliant; a master craftsman is at work here. Just one little observation, I think it’s rather ironic that Philip Pullman, a male writer, has a female heroine, and J.K. Rowling, a woman writer chooses a male hero. I believe Rowling could just as well have had a female protagonist, as all the qualities in Harry could just as well exist in a girl, and wish that she had done so; it would have raised the profile of women in literature. But the rather unpleasant reality of sexism in the world makes me wonder if the Potter books would have been as successful as they have been, with a female heroine. Although, it’s worth remembering that Bend It Like Beckham, did wonders for women football players. Equally, I don’t believe in dictating to writers and if that’s how the character came to her then that’s how it has to be. The comparison that I want to make between His Dark Materials trilogy and the Harry Potter books is that the Dark Materials trilogy, as well as being a brilliant read, containing magical elements, discusses serious issues, such as the existence of the soul and God, whereas the Harry Potter books don’t have this deeper vein. All the Birds Singing by Evie Wyld: this is a story that travels back to itself. Beautifully structured, so that we start in the present, then shift to a near past in Australia, and keep switching till the present and the past reach a crisis point. Jake, an Australian woman, is running a sheep farm in a remote area of Scotland. We begin to sense that something terrible has happened, which has mangled her life, and brought her to this desolate place, as well as the fact that when she rings home, she hides her number and never speaks. This is a book about wounded lives, families and finding love in unlikely places. The Reluctant Fundamentalist by Mohsin Hamid is a deceptively simple yet serious read. A slim book, barely 200 pages, it begins in a gentle, old fashioned manner as Changez, the narrator, tells his life story to someone who appears to be an American tourist in Pakistan. As they sit in a Lahore café, working their way through tea, snacks and food, Changez’s story of being a student in America, relationships, working for a valuation firm and his growing disenchantment are quietly sketched in. The personal, emotional and political are all brought together in a seamless and almost inevitable way. This book quietly lifts the covers on something important happening in our world. The Long Song by Andrea Levy. I was hesitant to start this book, as it’s about slavery on a sugar plantation and I wondered if I could bear to read another book about that pain and suffering. Actually Andrea Levy has a deft and sensitive touch, knowing how much to portray and how much to suggest. We ‘live’ the story through July and everything becomes vivid and personal through her. Neverwhere, by Neill Gaiman. I’ve always enjoyed stories that mix the ordinary and known with the strange and hidden. Where a simple door can lead to another world or where time shifts and turns the story into something else. “Under the streets of London, there’s a place most people could never even dream of… the city of the people who have fallen between the cracks.” Fast moving and inventive Neverwhere takes the reader on a crazy, unusual ride. The Kite Runner by Khaled Hosseini. I hadn’t read a book about Afghanistan, but the country is so perpetually in our consciousness that when I came across the Kite Runner it was a natural choice. Interestingly, for me, the Kite Runner is about guilt and the impossibility of burying it. A word that seems to hover over the country of Afghanistan itself; poor, beleaguered, suffering Afghanistan – who and how many are guilty of bringing it to this terrible condition? The book is about two young boys and an act of betrayal. Echoing the acts of betrayal by countries which have used Afghanistan as their battlefield. A sweeping epic story, gripping from the beginning to the end; it takes us into the heart of an ancient culture, and into the frail heart of being human. “There is a way to be good again…” is a line that I love from this book, acting almost like a beacon, making you hope the story will travel towards it. The Humans by Matt Haig. One of the chapters begins with a wonderful line: “Humans are one of the few intelligent beings in the galaxy who haven’t quite solved the problem of death.” An alien has taken over the body of Professor Andrew Martin and is finding life, family and people very confusing. However, at the end of his mission he writes to his fellow aliens: “And let us consider this: what if there actually is a meaning to human life? And what if – humour me – life on earth is something not just to fear and ridicule but also cherish? What then?” Indeed, what then? I like books that ask the big questions. Corinna Lang, Goodbye. By Vivian Connell. I doubt anyone will have heard of this book or have even read it. Another one of my finds in a charity shop, it was first published in 1954 and is about Corinna Lang, Hollywood film star, who sets out to play the most important role of all – that of herself. There’s espionage, danger, double agents and an enigmatic spy. Corinna is intelligent, witty and adventurous. Eat your heart out Mr. Bond. The Chalet School Stories. By Elinor Brent-Dyer. Another cheat I fear, but with around 58 novels in the series, it’s an amazing feat of sustained story telling, engendering the kind of addiction that soap operas create. These days we’d probably find some quite un PC sentences here and there but it’s also a world of snowy Alps, danger and plucky young women. Don’t forget to check out the rest of the blog tour – details below. Do any of Ravinder’s picks make your top ten list too? Guess what happens a month today? Yes, you’ve guessed it I’m a Christmas Geek – I love it, but do I love it as much as Harriet Manners the quintessential Geek Girl? (Awwww, somebody needed visiting by three ghosts). What Harriet doesn’t know an awful lot about though is dating… but when you’ve kissed Lion Boy that’s the next step…if he gets round to ringing you. 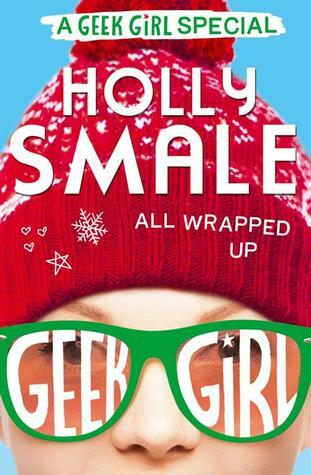 All Wrapped Up is a festive Geek Girl special from Holly Smale which fits into the events of the first book. Harriet is supported to reach her next relationship milestone by the usual suspects including my favourite stalker Toby and a rather suspect list on ‘how to ace a date’ that really should simply say – be yourself. Having recently been on a first date of my own at the time of reading this I felt Harriet was channelling my inner thoughts and paranoias, even though our ages are “a few years” apart. Dating – the universal evil! Holly’s comic style works well in short form and I found myself giggling along. There’s a comfort in coming back to Harriet, and it was nice to revisit her as she started out. The romance factor is this book is high, there’s ice-skating and plenty of falling. Things are not straightforward, but it’s a perfect Christmassy tale with a warm ending. Wait until a chilly day, come in from the cold, make yourself a hot chocolate and settle down on the sofa with All Wrapped Up. The book contains All Wrapped Up: a short story of what happens after that first kiss, as well as the previously limited edition short Team Geek, a Q&A with Holly, and some other festive extras – including a survey that you can test your gift giving skills with (although you might be banned from future family Christmases if you employ it). Huge thanks to Serena from HarperCollins for my copy (and the list of geeky facts), the fact that I didn’t have to chew your arm off to get it does not affect my opinion of the book. 5 stars. A couple of weeks ago I was lucky enough to host a guest post by Holly Webb on how she approached working with someone else’s characters. Now, I’ve had the opportunity to read Return to the Secret Garden thanks to Faye Rogers PR and Scholastic. In preparation I re-read my Classic Adventures version of The Secret Garden and really enjoyed rediscovering the garden along with Mary Lennox, Dickon and Colin. 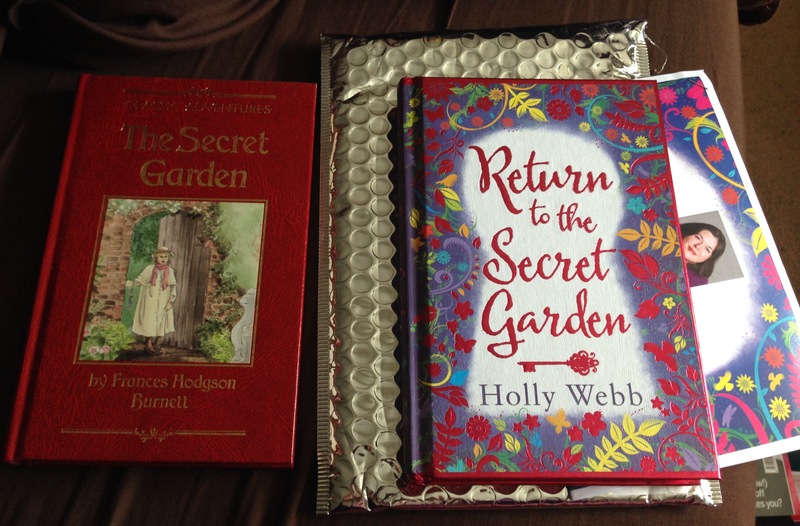 Holly’s sequel Return to the Secret Garden is set in 1939 at the beginning of the Second World War. Emmie is our protagonist whisked away from London to Misselthwaite Manor in Yorskshire before the bombs start dropping. She is forced to abandon a stray cat called Lucy, but as an orphan, everyone else she knows comes with her. Emmie finds a set of diaries in the room she is staying in and through them finds a connection to Mary and sets about following in her footsteps and finding the Secret Garden. The echoes from the first book don’t stop there, there’s a robin, a grumpy gardener and strange crying noises in the night. As Holly said, the main character she used was the house and its gardens but we do also get to meet the original characters but not perhaps in the way we’d expect. The presence of war invades and not everyone has a happy ending. Because the garden hasn’t been abandoned we don’t quite get to see it coming to life in the same way as the original but Holly has done a fantastic job of making connections to the original alongside creating her own story. You won’t need to have read The Secret Garden…but I’d advise that at some point you do. Return… is a fitting follow up that gives us insight into the life of the garden and the characters from the first book whilst introducing us to a new group of children and that cat called Lucy… the magic of the garden is at work again. This is the last post on the tour but do check out what everyone else thought too. Return to the Secret Garden is out now.